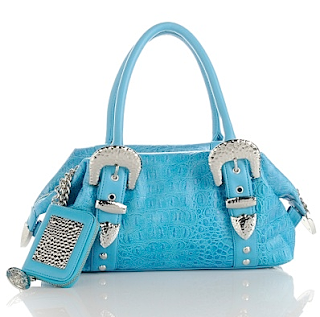 A few months ago in TJMaxx I happened upon the most bright blue, big leather bag - just the thing that I love. I could tell it was one of the more expensive bags they have there - I always seem to pick up the most pricey bags in the store. It was by Charm and Luck, with an original price tag of $376 and the TJX price of $80. After carrying it around like I already owned it for the next hour while I shopped I finally convinced myself that I didn't need it. A few days later I was wishing I had it. Now I've found it on HSN for $56 including shipping, so there you go!